Recaps, summaries, updates, news and reviews about movies and Tv shows. Think of a number between 1 and 1000. Do you have your number? Good. I guarantee that by the end of reading this book it will be a 10. Retired NYPD detective Dave Gurney is contacted by an old acquaintance by the name of Mark Mellery, who has been receiving letters in which a mystery person, signed "X. Arybdis", writes a series of poems, first creating panic and fear as he predicts the exact number Mellery is thinking about. "What he took he will give, when he gets what he gave"
Gurney then proceeds to try and uncover not only the mystery behind the letters, but also the identity of the perpetrator. When Mellery is murderd and the crime scene evidence left behind is found to be strategically placed there, making no sense at all, it quickly becomes clear that the culprit is smart, cunning and hungry for more blood. Diving into the world of mystery, murder and the past, Gurney finds himself in a game in which only one can prevail. Dave Gurney: incredibly intelligent, introspective and insightful, yet has many interesting flaws that make him more relatable. He analyses everything and everyone he sees. He possesses a mindset of extreme alertness and skill. With each page, a new layer of his personality is portrayed in such a way, that one can simply not get enough. Madeleine: nature loving, not to be underestimated and full of surprises. She is the inspiration behind a lot of cracked puzzles and poems, as she constantly shares her input. She wishes for Gurney to settle down into their new way of life, but deep down is aware of Once a cop, always a cop. Sheridan Kline: The district attorney, extremely obsessed with press and publicity that will benefit his career. He employes Dave as a special investigative consultant in order to keep the rather famous and newly retired detective on the case. He also appears in the second book. "Think Of A Number" is one of those books you read in one night because it grips you with such a force it's very hard to stop. Before I read this book, I never really was that fond of mystery crime thrillers. Something about them always seemed so repetitive. This book however, is what introduced me into the world of crime fiction and made me love it with all my heart. I have since reading this book proceeded to read the next two in the "Dave Gurney" series, which both impressed me immensely. John Verdon writes with such detail and attention, which is part of the reason the book is such a suspenseful and thrilling read. The poems in the book were so gripping, that I even got inspired and gave poetry a try. (and failed miserably) While reading this book, I felt like I was present in Dave Gurney's brain. I could read his every thought, which I admit could get very heavy on the mind sometimes, but nevertheless made the storyline so much more original and heart stopping. The number aspect is what really got to me from the very beginning to the end. I honestly couldn't put the book down and it was the main motivation behind the 24-hour-read. The result fascinated me, as it was unlike anything I had read. The mystery and puzzles were thought out with incredible detail, which along with the wide range of individual characters balanced out the whole book in the best way possible. The killers few monologs changed things up a bit, often putting various clues into perspective and creating an even more suspense-packed storyline. In conclusion, I not only recommend this book to crime novel lovers, but also to people, who want to add something new and unique to their reading experience. 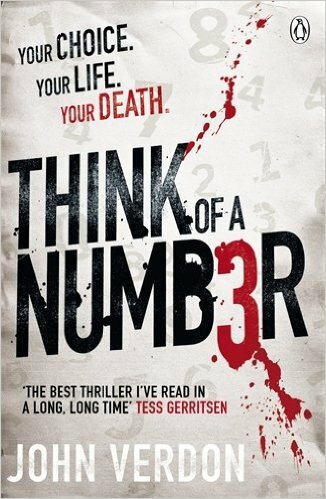 "Think Of A Number" is the source of my newly found love for books in this genre and has exceeded my expectations sky-high. he reaps what he sows. It's good to be back. I missed blogging. I have been contemplating wether or not I should also start reviewing books on this blog for a long time and finally decided that I wanted to. You do not know me, but if you did, you would know that I am a bookworm. A real big one. I normally fly through one book in a week. Well, long story short, this is my first book post and I would like to know if you liked it and if it's something you would like to read about in the future. Your opinion would mean a lot to me, as I am unsure if books fit into the type of blog you guys are used to. So, leave some feedback here or on my social media platforms, it would definitely help me out! Also, if you are registered on goodreads, you can see more of my book reviews there! Thank you, that means so much! If you haven't found an audiobook yet, I recommend checking out audible.com - I've listened to another part in the Dave Gurney series on Audible, so I wouldn't be surprised if they had the first part on there too!